Battery Status Indicator Designed and developed to make the maintenance of the battery in the lawn mower easy and convenient. Installs directly to the battery using the eyelets. 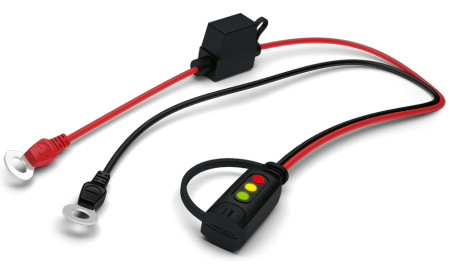 The indicator has a user friendly quick connect, which allows for a direct connection with the battery charger. The indicator shows the battery's charge level simply and clearly with the 3 different colored LEDs. Red: Indicates a charge less than 60% Yellow: Indicates a charge above 60% but fewer than 80% Green: Indicates a charge over 80% Comes in a Husqvarna retail-ready box.